Update your bedroom or dorm with this soft and fluffy Faux Fur Saucer Chair. Super comfortable, this soft short plush folding chair is perfect for reading, watching TV or just relaxing.This cozy saucer chair is a perfect decorative addition to update any room. Larger size is much more suitable for adult. Chair easily folds up and can be stored without taking up much space when not in use. No assembly required. Sturdy metal frame. Dimensions:23.5" x 23.5" x 35.5". Weight capacity: 280 lbs. Much more large Moon saucer chair with Sturdy Steel Frame design, supports up to 280 lbs. 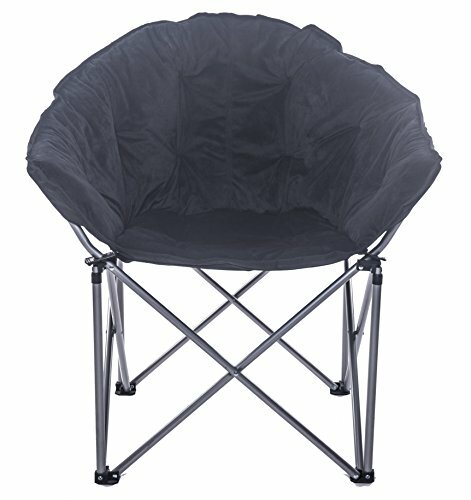 Foldable Chair: Space saving & Great for lounging, dorms or any room.30-DAY Money Back Guarantee. Dimensions of Folding Dorm Chair: 23.5" x 23.5" x 35.5". Larger size is much more suitable and comfortable for adult.